This stage version of Joseph Conrad's novel is less of an adaptation and more of a total revision. It changes location, period, gender, race and context – and yet it retains many of the unsettling issues which sit at the core of the story. Conrad's classic sees the trader Marlow travel up the Congo river to discover the mysterious station master Kurtz – a man whose charisma and cruelty have ensured he is the most powerful but also the most feared and distrusted person in the company. In this production, created by imitating the dog theatre company, the story is turned on its head with Marlow becoming a Congolese woman travelling to London to uncover Kurtz. But it's an unrecognisable Europe, one which has been destroyed by war and where concentration camps form the slave labour which keep the trade alive. Since it was written more than 100 years ago, Heart of Darkness has led to a good deal of heated debate not just about colonialism and the atrocities which were committed in Belgian Congo but also about Conrad's views on Africa, Africans and their European colonisers. Created by imitating the dog's three artistic directors, Andrew Quick, Pete Brooks and Simon Wainwright, this production aims to not simply revise the story but also to address these questions. It does so by making the stage a film set with the film being Heart of Darkness. In between filming, the producers and cast of the make-believe movie hold numerous discussions about their creation. They read sections of the novel, discuss its critics, debate its controversies and therefore explain the decisions in their narrative. In doing so they bring in diverse cultural and historical references including Nigerian author Chinua Achebe, the Nazi death camp Treblinka and Francis Ford Coppola's epic film Apocalypse Now, which also famously re-told Heart of Darkness, moving it to the Vietnam War. While this does ensure plenty of food for thought, sometimes there is simply too much happening at the same time. 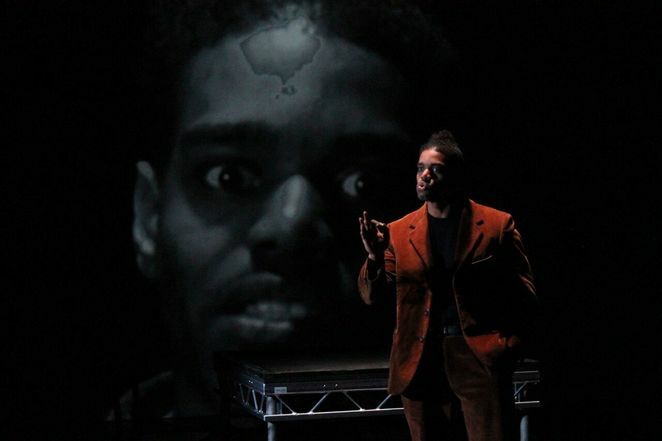 There are a few instances where a speech from history is being projected onto a screen at the same time as an actor is reading slightly different lines and it's difficult to know whether to read or listen – the risk being that neither is really absorbed. 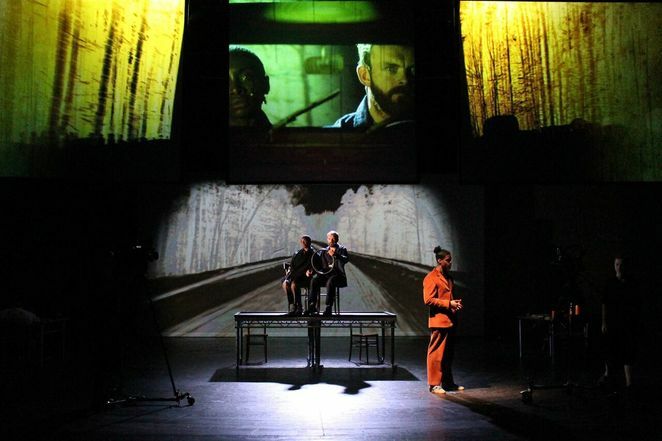 Imitating the dog is renowned for its use of design technology so it is no surprise that Heart of Darkness uses film and projection as in integral part of the story-telling. The film being created on stage is being recorded in real time and projected onto screens above the stage so the story takes place on two levels – both literally and figuratively. Seen at the Studio at Birmingham Repertory Theatre, those sitting at the back of the theatre space therefore have the better position as they can see both areas more easily while those at the front are constantly having to look up and down to ensure they are catching everything. Keicha Greenidge's Marlow begins the drama as a private detective motivated by money but on her journey, she learns how greed can corrupt entire societies and, when given a choice when she meets Kurtz, chooses morals over money. Greenidge convincingly takes us on that journey as she moves from cynicism to emotion. Matt Prendergast plays a whole range of roles from a chillingly amoral Franz Stangl, the commander of Treblinka, to an equally unnerving Kurtz. Morgan Bailey, Laura Atherton and Morven Macbeth share numerous other roles between them, switching parts with ease. By raising so many points of discussion, this show re-examines a classic novel in a new way – turning it inside and asking us all to reconsider its story within a modern context. But paring it down just a little would ensure the audience could focus on the issues being raised one at a time rather than attempting to disentangle a forest of ideas. Heart of Darkness is at Birmingham Rep until November 24 and then takes a break before further UK dates between March and May. See www.imitatingthedog.co.uk for tour details.